My New Web Store is open! --Ability to show lots of photos on each product page. Look under the product photo to see if it says 'larger photo' or 'more photos'. --I'm thrilled with the SEARCH function because it.. well.. it WORKS!... It's on the top right side bar, give it a whirl. --If you create an account it saves your information, it lets you create up to 10 shopping lists (which is SO COOL), you can email your friends about products, and you can leave comments about products. This is optional but it is a great time saver on future orders. Sewing is a way to turn your dreams, your imagination, and your ideas into real life "goods." 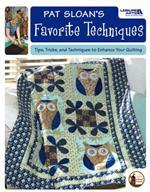 Presented in a class format by Pat Sloan, a fabric-obsessed sewing and quilting teacher, this book gives you the basic information you need to have your sewing machine humming and your needle moving lickety-split. 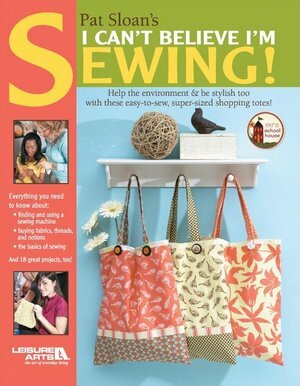 From how to find a sewing machine to buying fabrics and notions, this book will have you sewing in no time! Beginner introduction to sewing, plus 18 projects: Coaster Set; The Perfect Table Runner; Scarf Magic; Oh-So-Soft Baby Blankets; A "Green" Grocery Sack; A "Ditty Bag" for Every Use; Shower in Style; Valance Love; A Summer Spread; "Round and Round We Go" Pillows; and "Easy Peasy" Pillowcases. Click the link under the photo on the product page to see some of the other projects in the book... woot! Have you been to my lecture? Than you KNOW I not only ADORE Sunflowers but I'm ...mmm .... well... I'm just a tad OBSESSED with them... hehe! When I found these I HAD to get them for the store! They are so fabulous in person. These will look SO GREAT in a Stepping Stones pattern. I've added the supply list for Stepping Stones to the pattern page. 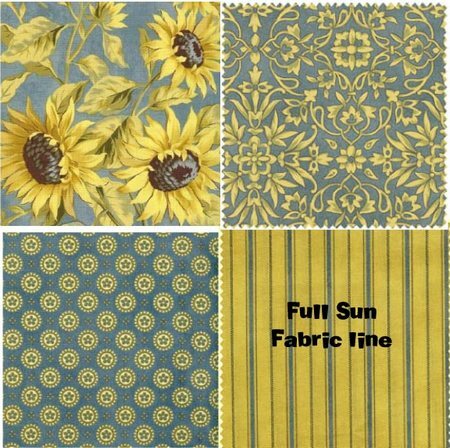 CLICK HERE to the Stepping stones page where I've featured all the Full Sun fabrics and a 5th fabric that goes with it for a FABULOUS Stepping Stone quilt! Also ideas for placement ... brown could be binding to go with the brown in the sunflowers. 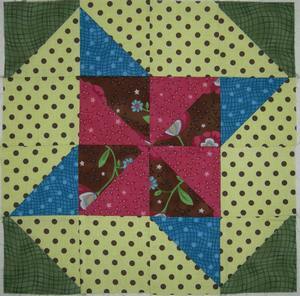 Or maybe use some of the sunflower for a Sweet Fall wall hanging. Leave off the words and use as a table topper with a fabulous bunch of sunflowers in the center! 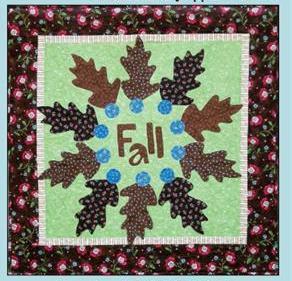 CLICK HERE to the Sweet Fall quilt (supply list on the page now). Fabric I used is listed after the supply list. Yes our next SeW AloNG! starts on Friday Sept 5! 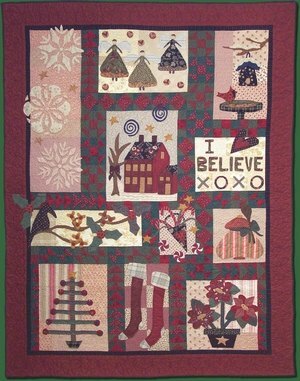 We'll be making I Believe... (if you have already made this quilt then you can work on finishing Sunday Drive or any other bigger applique project you have of mine). Twice a month I'll post a note to keep you motivated to sew. I'll give you a block and sashing to do (yes.. we'll do sashing WITH the blocks... much easier if you can do it this way). AND... if you FINISH the block AND SEND me a photo or a link to your photo... you will be in the running for a little prize... woot woot! On MOST Wednesdays I'm going to feature a product more 'in depth'. I may show photos of projects in the book, how to use a product with a little video, how to combine the project with other things, or how to use it in a different way. On the RIGHT SIDE BAR of the blog is a category list. If you click Wednesday Window you'll get all the blog posts in that category... sweet eh? 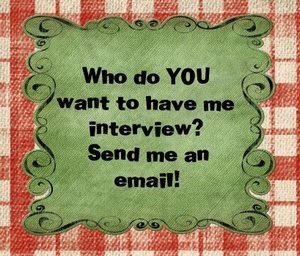 I thought it would be SO FUN to have some of my friends do an interview for my blog. I have a neat set of questions and on September 4 is my first interview with the super cool Karen Snyder, fabric designer and author. Later in the month will be the awesome Sue Spargo! So be sure you check my blog... yep... that's where it will be! Two this time from resident Chef Pam and Jeanna! From Pam a Baked Lima Beans that sounds very much like the one we made when I was a kid (remember that one mom?). 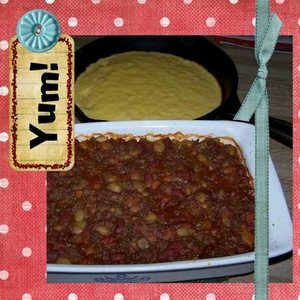 And Jenna's bean casserole sounds so good we had to share it too! Book club - Pick up your reads through my amazon store to help support this FREE club... thank you!!! 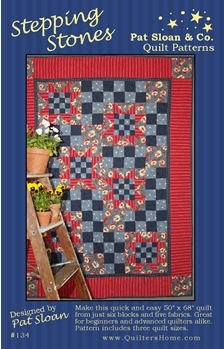 CLICK HERE for the border pattern (mine isn't done yet... but once it is I'll upload a photo.. I promise! 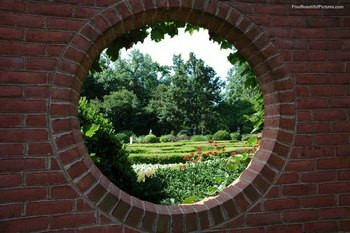 September is our next Virtual Retreat Weekend... yeah us!!! Mark off Friday Sept 26 to Sun Sept 28. We'll sew, eat, share, and have fun in our very own virtual world. I've run a few of these and they are incredible fun. We'll post photos of our snacks, projects, food we want to make, things we buy at our local stores, things we want to buy, and maybe more FOOD of some sort.. hehe!!! 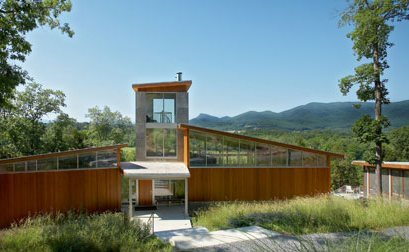 It is super fun to check in to see what others are making, what they are buying, where YOU need to go to buy things, just like a IN Person retreat... LOL! I plan on one REALLY NICE prize... but not telling what it is. The BIG PROJECT for the weekend will be 'Label Making Day'. I'll give you some patterns to download, I'll do a video, and if you want to be REALLY prepared, be sure you have my Favorite Techniques book as this has info on some of the stuff I'll be showing. I'm so excited... we are going to have a GREAT time! ...the greatest miracle for me was getting started.